The Saints are on their way to USCAA national tournament, March 4-7, 2015. You can follow the tournament on social media using #USCAAbball15. The Lady Saints will face Penn State-Fayette in the opening round of the USCAA national tournament at 6 p.m. Thursday, March 5, 2015. Fayette has an overall record of 8-17, but went 8-7 in conference play. Fayette has a well balanced offense, with three of their starters averaging over 11 points per game. They also average 18 3-point shots per game. If the Lady Saints can defend the 3- point line well, while Regina Steele protects the paint, the team should be successful. The Lady Saints had an overall undefeated 15-0 record within the YSCC, which earned them the No. 1 seed in the national tournament. Steele led the team in rebounds and will likely be a key to success in this tournament. If the Lady Saints utilize her in the paint, they will create open shots for guards Chontayvia Kennedy and Jazz Laracuente. Kennedy was named MVP following the conference championship match and is expected to provide the Saints with similar play in the national tournament. The Fighting Saints men will face Central Penn College in the USCAA national tournament quarterfinals at noon Thursday, March 5. The Fighting Saints are the No. 6 seed, while Central Penn is No. 3. Central Penn will challenge the Saints defense as they lead the USCAA in points per game. 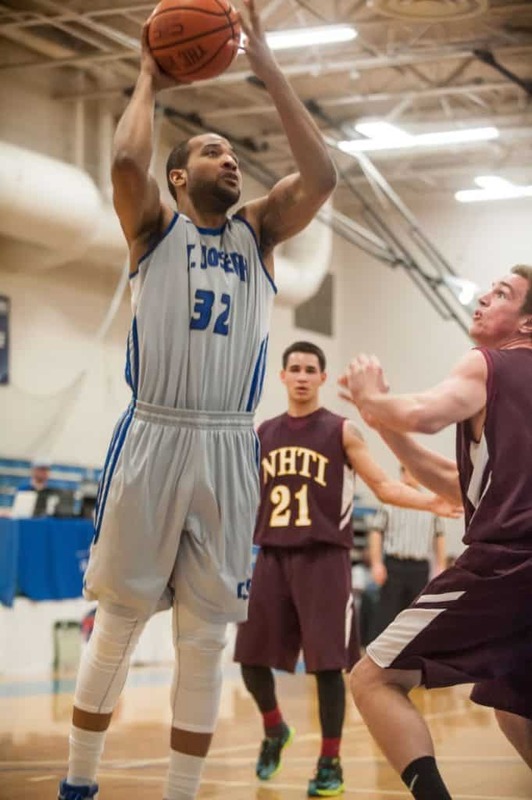 Devon Dorsey leads the opposing team with 22 points per game as a three time USCAA All-American. The Saints will have to play good team defense and make sure they limit Dorsey’s scoring chances. The Saints go into the game having led the YSCC in 3-point shots made per game. They will look to keep that going against Central Penn. Dre Anderson is expected to provide the Saints with points as he has led the Saints throughout the season in scoring. Kashean Alston has been a strong force in the paint, averaging 15 points per game while collecting 8 rebounds per game. Defense will likely play a large factor in this game; if the Saints can play good defense and keep the game close, they will be able to use their strong outside shooting to be successful. The tournament is being hosted by Penn-State Fayette in Uniontown, Pa.